Houston is one of the largest and most diverse metropolitan areas in the United States. 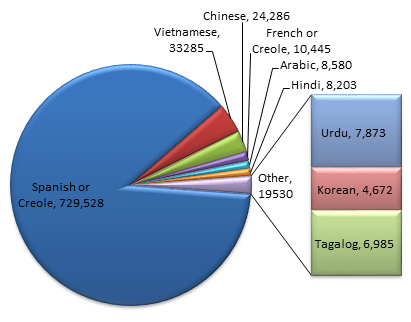 The variety of native foreign languages of many of Houston's residents reflects the map of the world. In order to ease the access of non-native residents to the city's public services, the City Administration took on an initiative to cross the language barriers and reach out to such residents in their native languages. The Executive Order 1-17, signed by Mayor Annise Parker calls for each city department serving the general public to develop a Language Access Program (LAP). Each LAP outlines the way in which a Language Access Coordinator for that department will oversee the provision of translation and interpretation services to facilitate city operations. This initiative, called iSpeakHouston, connects qualified language services professionals with those who need their help. The goal is to make resources and opportunities available to all, regardless of the indivdual's primary language. Founded in 1981, Universe Technical Translation (Universe) has a long history of quality and dependability in language services, particularly in the Houston area. As a State of Texas approved quality language services provider, we at Universe have helped to address cross-language needs of many Texas government entities. Now, we also work with the City of Houston to provide language access as part of the iSpeakHouston program. Universe speaks all the IspeakHouston languages. If you seek the assistance of a translator or interpreter in dealing with the public institutions of the City of Houston, please contact us at (713) 827-8800 or main@universe.us.